Kenilworth Lions Club has awarded the first two grants under its new Dream Scheme, launched recently to celebrate fifty years of charitable work by local Lions since the Club was founded in 1969. Northleigh House School has been pledged a grant of £1,000 towards the costs of providing a new outside wooden building for all sorts of music. The school does amazing work with children and young people, helping them to overcome anxiety and raise self-esteem, and giving them the skills to deal with life in the wider world. A sum of £1,000 has also been pledged to the TWDA Competition Squad, a group of nineteen students from the Whiteman Dance Academy, who are raising funds to go to Euro Disney near Paris to perform in a show there and to take part in the Disney Parade during 2019. They have already passed the Disney auditions, and now need the funds to turn their dreams into reality. There is still plenty of time and opportunity for other groups and individuals to apply to the Dream Scheme before the closing date for applications of 1st March 2019. 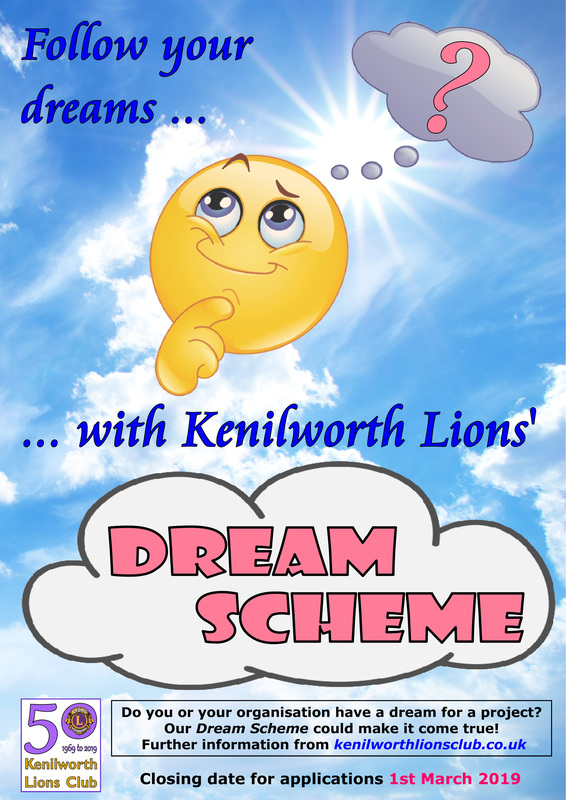 Details are available on the Kenilworth Lions web site www.kenilworthlionsclub.co.uk or by emailing kenilworthlionsclubdreamscheme@gmail.com. Application forms can be picked up at the Lions Furniture Store in Farmer Ward Road on Saturday mornings, or at the Kenilworth Centre Reception Desk on weekday mornings. Alternatively a form can be downloaded from the web site, or filled in online.